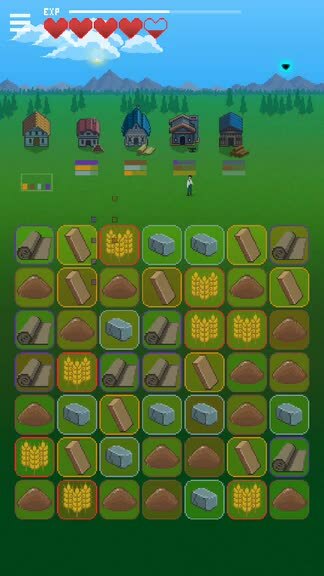 Super Gridland ($1.99) by doublespeak games is a new match-three kingdom-building RPG that will put your strategic matching skills to the test. 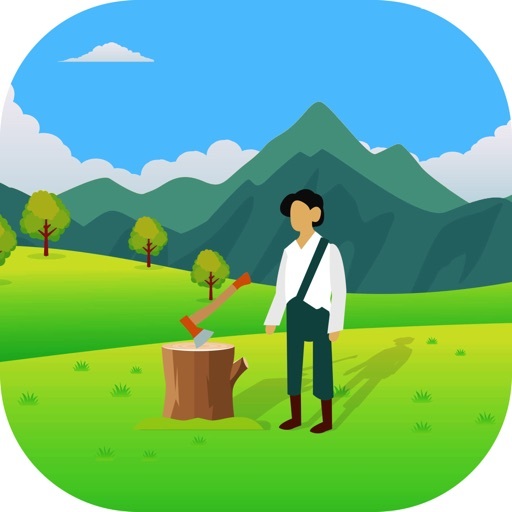 If you enjoyed games like You Must Build A Boat, 10000000, and Hero Emblems, then you will love what Super Gridland has to offer. Even though a lot of my gaming is being done on my PS4 these days, I still love to turn to my iPhone for those rare moments of downtime between work and classes. On the mobile platform, one of my favorite game genres is puzzle, with the majority falling under the match-three category. 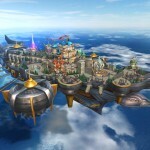 However, with most match-threes being the same thing with a different skin, I am even more intrigued by the match-three RPGs because they add an entire new layer over a tried-and-true genre. While I’ve gone through my fair share of them, I don’t think I’ll ever get tired of them and am always looking out for new ones to try out. 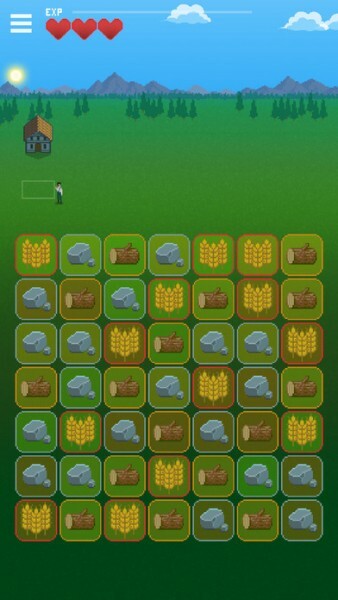 So naturally, when I saw Super Gridland on the App Store over the weekend, I knew that I had to try it out. It probably goes without saying, but I am not disappointed with Super Gridland. Visually speaking, Super Gridland features a nice retro aesthetic with the pixelated art style. If you grew up with the old-school consoles back in the ‘80s and ‘90s, such as the SNES and Genesis, then you will feel right at home with the graphics in Super Gridland. And while the game sports the pixelated look, everything in the game is still fairly detailed, from the buildings that your character ends up creating to the enemies that come out at night for you. I do wish that the character sprites for your character and enemies were a little bigger, as it can be hard to see compared to everything else. The game has a nice variety for the color palette, as it features bright and vibrant hues during the day and dark, creepy tones at night. Animations are smooth and fluid, and there was no lag on my iPhone 7. Super Gridland also features a fantastic chiptune soundtrack that is a joy to listen to in the background, and the sound effects are top notch. It goes without saying that the developers have done a great job with Super Gridland in terms of the visual and audio department, though I still think that the character sprites could be a tad larger. So what is Super Gridland, exactly? 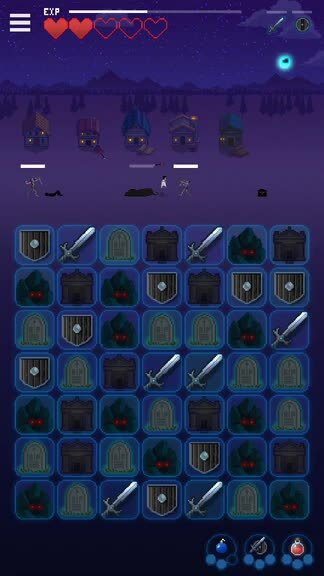 While it’s a match-three RPG game like YMBAB, it’s slightly different from what you may be used to, because it’s more of a turn-based strategy game than frantic match-three combo-fest. The game supports three save files so you can have multiple adventures going at once, but each slot will have it’s own player progression. In Super Gridland, you will help your nameless protagonist collect resources during the day in order to build up a village. But as time passes, night will come, and bloodthirsty monsters will begin to come in and attack you and your small village. As each day passes, new resources get introduced and night combat gets more difficult, but when you die, you’ll just pick up on the day that you left off on. 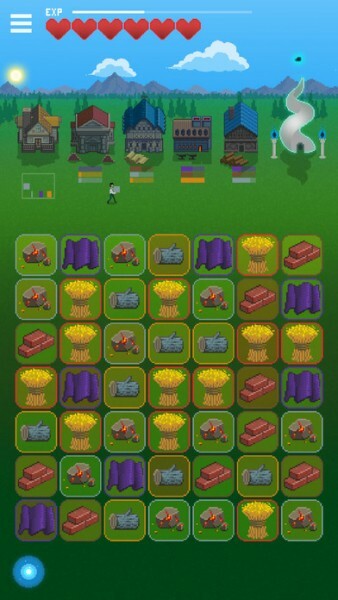 The gameplay of Super Gridland is simple enough: make matches of three or more in a vertical or horizontal line in order to collect resources or survive in battle (attack, shield, heal, or even bring out more monsters). Like all match-three type games, it’s best to create bigger matches, as they can also lead to chain combos. 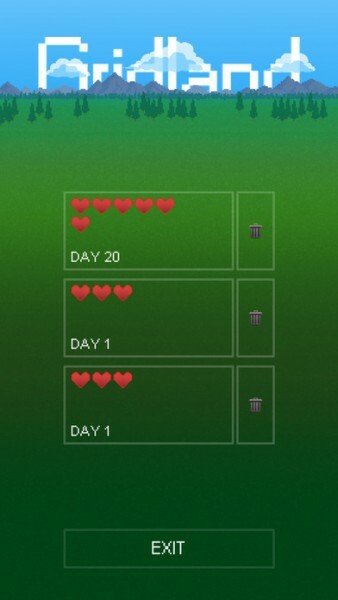 As you make progress in the days, your character will grow stronger, and you’ll eventually end up with more hearts so survival becomes a bit easier, though you still have to think about your moves carefully. Controls in Super Gridland are simple and straightforward enough, especially if you’ve played these types of games before. 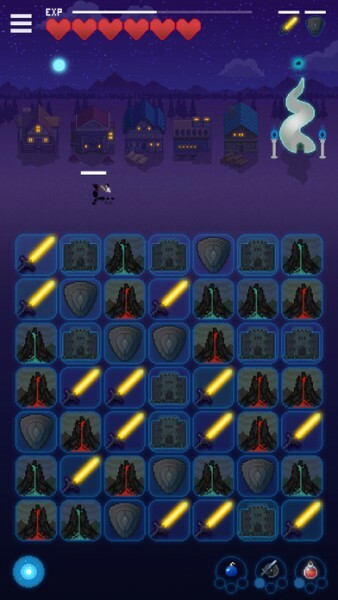 Each game consists of a grid that has a random assortment of resource (day) and combat (night) tiles. 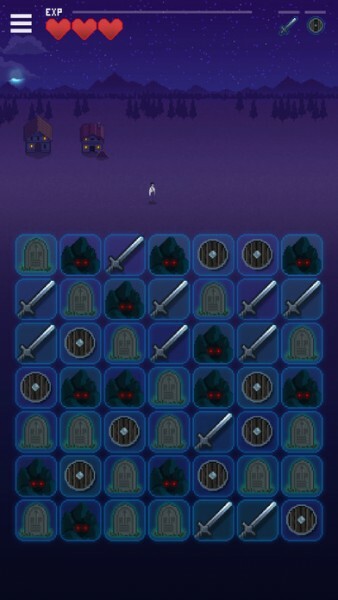 In order to make a match of three or more, you’ll have to select the tile you want to swap, and then swipe it in the direction that you want it to move to, or just tap on an adjacent tile to switch them with each other. While the control scheme works alright, I did find that it was a bit clunky at times, where my swipes and taps weren’t being registered. Hopefully the developers can optimize the controls a bit in a future update to make it more streamlined, but still, it works if you’re just a bit careful with where you tap and swipe. As a big fan of games like YMBAB, I just had to try Super Gridland. I’m pretty happy that the gameplay elements are slightly different from YMBAB, because in that game, it was all about being fast with the matches you were making, whereas Super Gridland requires a bit more thought and patience. It definitely takes a bit of getting used to, and if you like the mechanics of YMBAB and play Super Gridland the same way, chances are you will die fairly quickly when nightfall comes. I had to play a few rounds before I finally got the hang of things, but I can assure you that the result is worth the time required you need for some practice. 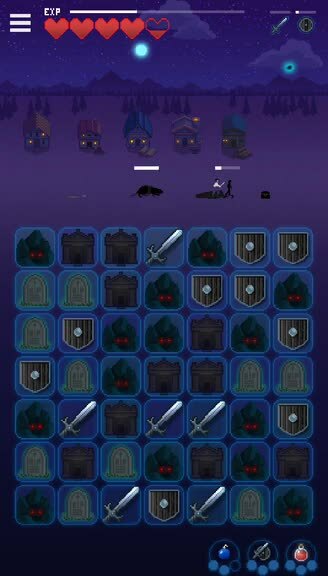 The only problem is due to the size of the sprites, it can be hard to notice when you’re in danger of dying, especially since the game doesn’t give you any kind of audible warning when your hearts (located at the top of the screen) are about to be depleted. Still, with the awesome graphics and fun music, Super Gridland is definitely one game I’ll continue playing for a while. I just hope to see larger character sprites and some kind of visual or audible warning regarding critical health levels. Another thing to note is the fact that the game kind of just throws you into the middle of things without any explanation, so it’s up to you to figure things out on your own. While this doesn’t bother me too much, it may be a bit more problematic for newbies to the match-three RPG genre, so perhaps the developer should add an optional tutorial mode. I recommend giving Super Gridland a try if you are in the mood for a challenging turn-based match-three kingdom-building RPG. 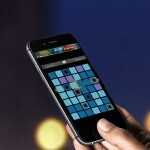 You can find Super Gridland on the App Store as a universal download for your iPhone and iPad for just $1.99. There are no in-app purchases.